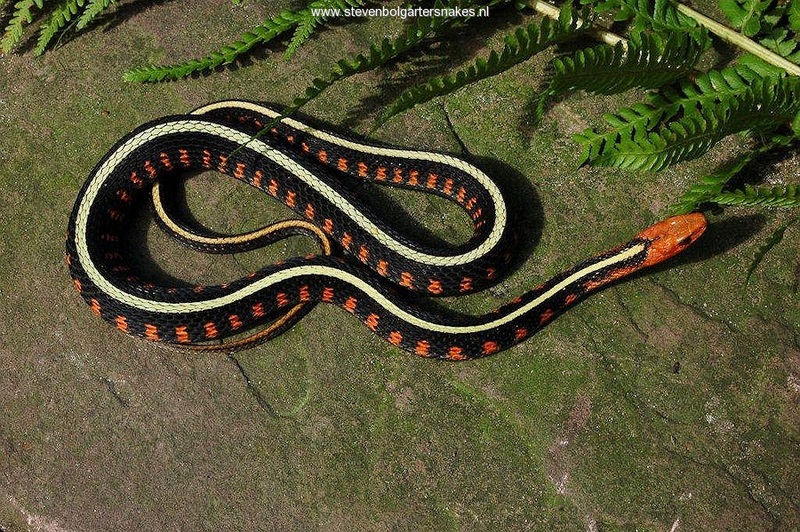 Thamnophis sirtalis concinnus is one of the most beautiful subspecies of T.sirtalis (together with T.s.infernalis and T.s.tetratania) and many consider it to be the most beautiful gartersnake. 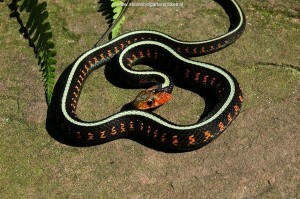 I must say that looking at my first live Oregon Red-spotted Garter Snake (in the wild) was a breathtaking experience. 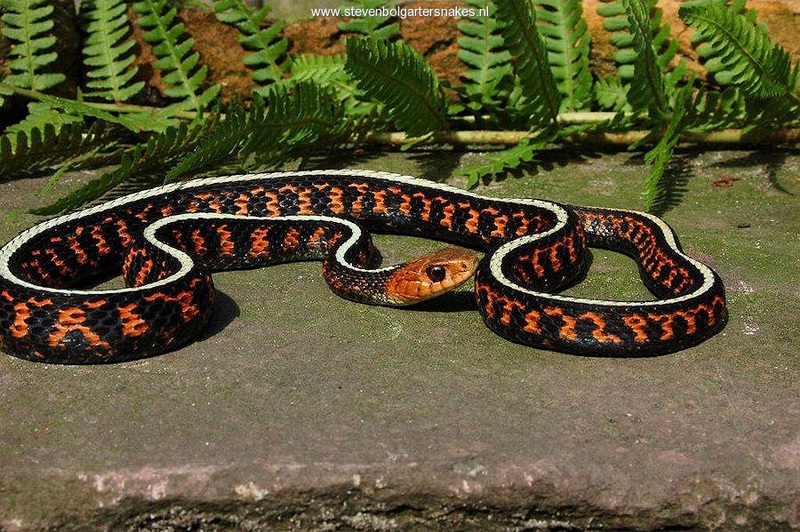 This subspecies has been high on the list of many a garter snake enthusiast (including myself) for many years but only in the last couple of years (since approximately 2006) captive bred specimens have become (limited) available in Europe. The snakes are relatively slender build. 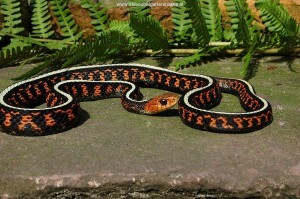 The females can become quit long: easily 90 – 90 cm. The males stay much smaller; normally 70 – 80 cm total length. Maximum length for T.sirtalis (females) is 137 cm, but this is very exceptional. My biggest female is 107 cm at an age of 9 – 11 years. Adult male (nr. 75, captive bred) 3 years old. 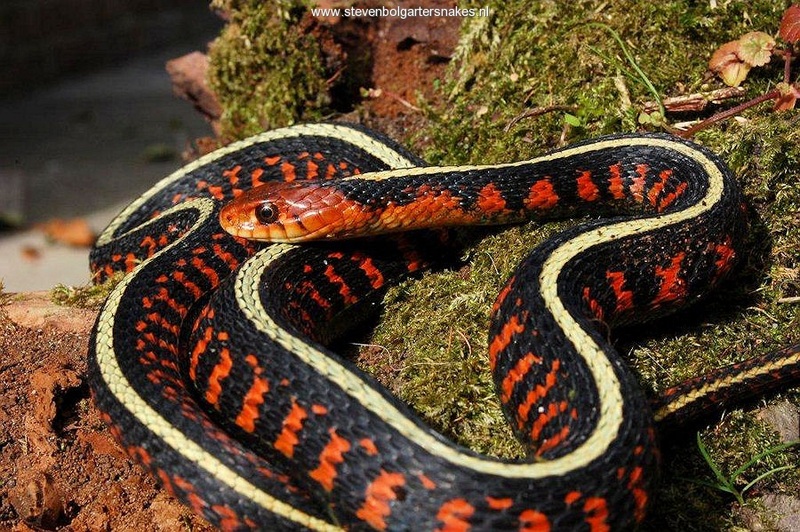 Typical for this subspecies is the beautiful red head and the large red spots on the sides. The intensity of the red color of the head (and to a lesser degree on the sides) varies considerably between the different specimens. Also the amount of red on the sides and its pattern varies considerably. 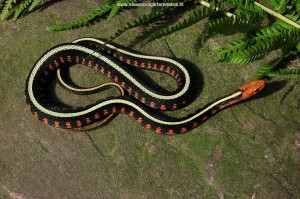 The lateral stripes are normally not visible. The dorsal stripe however is very pronounced with a whitish a yellowish color. This diurnal species is almost always clearly visible in the terrarium, as long as it is not too hot. Basking under the heat lamp on a branch or on the ground. It will give you a lot of joy observing the snakes. Normally this species feeds well and quit voraciously. They do well on a diet of only fish but most specimens readily accept mice as well. In the wild (especially) the large females from some populations probably will feed mostly on mice. I always hibernate my Oregon Red-spotted Garter Snakes, also the young ones, for a minimum of 8 weeks (the babies) to more then 12 weeks. I feed my snakes almost exclusively on fish (supplemented with vitamin B1) and when I have a shortage of (larger) fish I give them mice. The babies also like to feed on worms. As a guideline for the minimum size to keep one adult couple couple I recommend 60 x 50 x 50 cm. This beautiful garter snake occurs on the west coast of the United States, mainly in the western (coastal) part of the state of Oregon. There is some discussion on the distribution of the different subspecies of T.sirtalis on the west coast. This subspecies may also occur in coastal Washington and Northern California. Habitat T.s.concinnus; Overvieuw slough and surrounding area (Willamette valley, Oregon). My breeding group originates from a population from Polk County in the Willamette Valley. They can be found in an agricultural area with gradual slopes. A local tree grower told me that he appreciates the garter snakes on his farm since they will control the mice population. They often occur relatively far away (several 100 meters) from ponds or rivers on spots where there are no frogs or fish to be found. Mice are abundant though. 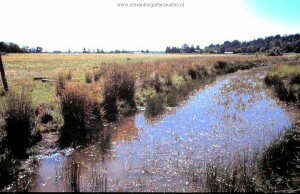 The Oregon Red-spotted Garter Snakes share this habitat with the smaller Thamnophis ordinoides. 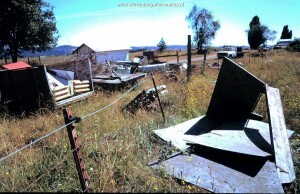 Oregon can be quit wet, cool and rainy, especially in winter and springtime. 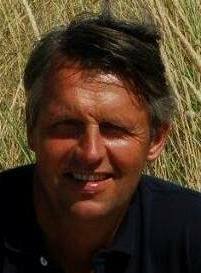 The summers can be quit warm and dry, especially further away from the coast. The snakes will hibernate for a few months in the winter but can be found as early as mid-january (the males) basking on mild days. 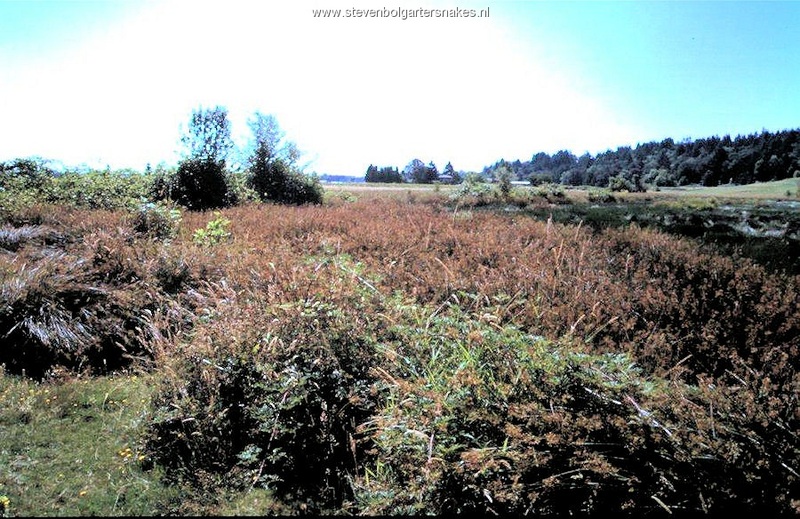 My article about Thamnophis atratus atratus (that can be found online on this website) can serve as a general guideline how to keep T.s.concinnus. My breeding group consists of (offspring of) 8 unrelated wildcaught snakes which makes it possible to offer baby snakes which are unrelated and to set up breeding groups without the danger of inbreeding. 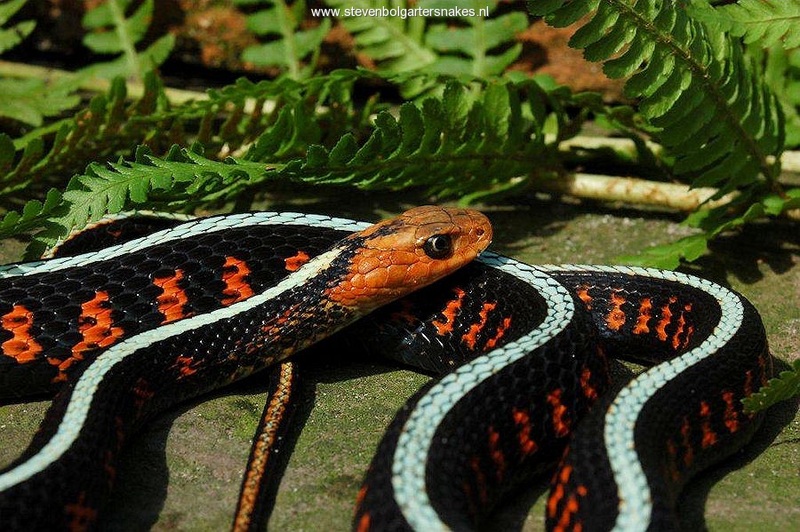 The young snakes often lack the intense red colors just after birth. After each shed the red color seems to become more intense. 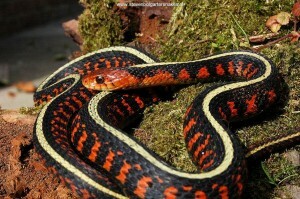 Often it is difficult to judge how the snakes will turn out when they are adult as far as red coloration is concerned. It can easily take several months to more then half a year before they have their final red color.